2017’s Bowl-A-Rama is just hours away and again this year, it will be broadcasted live and direct from Bondi Beach, Australia beginning today. Be sure to check out the schedule of events and tune into the webcast right here. The Vans Pro Skate Park Series in Huntington Beach wrapped up its final stop of Global Qualifiers for dozens of hungry competitors. On Friday more than a hundred skaters battled it out for just nine spots available to the semi-finals in in one built-to-spec custom designed park course for the chance to earn their spot to the World Championships in Malmö, Sweden later this month. 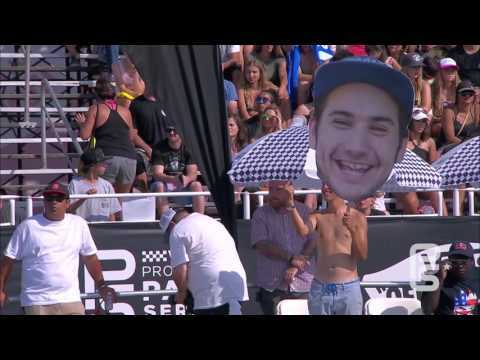 Park Series Select Pro Chris Russell nailed down a first place run in Huntington Beach on Saturday to claim his second Vans Park Series Global Qualifier win of the season. But Ben Hatchell surely gave him a run for his money with an assortment of heavy stunts with technical control. Sweden’s Oskar Rozenberg Hallberg took home third place with speed, style and great combined use of the entire park. Italy’s Ivan Federico didn’t advance into Saturday’s Final, but now sits atop of the Global Challenger rankings where seven additional rippers from around the world will join him and the Vans Park Series Select Pros in Malmö. Visit www.vansparkseries.com for the latest updates and follow the action on Instagram, Facebook and Snapchat at @vansparkseries. After bailing his previous runs and sitting in 7th place, Pedro Barros turned up the heat and put the peddle to the metal in his fourth and final run to win the second stop of the Vans Skate park Series. It all played out in his hometown of Florinopolis, Brazil where the crowd in attendance fueled his fire and he delivered. Italy’s Ivan Federico held onto second place with a great display of technical ability and style and Kevin Kowalski killed the park in his own unique way and returned to the podium in third place. Compiled scores from the two Vans Skate Park Series stops has Tom Schaar now sitting in first place in the challenger rankings. The next stop takes place in Vancouver, BC on July 9th. The top five Challengers to emerge from the Mens Park Series Global Qualifier system will challenge the fifteen exclusive Park Series Select Pros in Malmö, Sweden for the inaugural International Skateboard Federation-sanctioned park terrain Vans Park Series World Championships. Drop by www.vansparkseries.com for the archived webcast feed, latest updates, contest schedules, rider profiles, and follow the action on Instagram, Facebook and Snapchat at @vansparkseries. http://www.vimeo.com/156153220 Dodging a wet weather forecast, both Tony Hawk and Bucky Lasek skated tough to defend their Bowl-A-Rama titles this weekend in Bondi Beach. Roll the highlight reel. Be sure to check back with the Bowl-A-Rama site for the soon-to-come replay of the live webcast. The sophomore year of X Games Austin is a wrap and the skateboarding events delivered many highlights despite the relentless early summer heat. Drop by The Boardr and CA Productions sites for more info along with photos and video clips from the past three days. Head over to the X Games site for complete results.